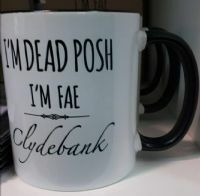 Show of where you are "fae" and just how posh you are with one of our personalised fridge magnets. A great wee gift or a treat to yourself! Made in Scotland. Dimensions - 50x50mm. Comes in a protective clear bag.